Warning: None of the Goddesses on this page were Park Royal built! Not all Green Goddesses were green! Indeed so; and even though none of these vehicles were made at Park Royal, this fact should not go unmentioned here. 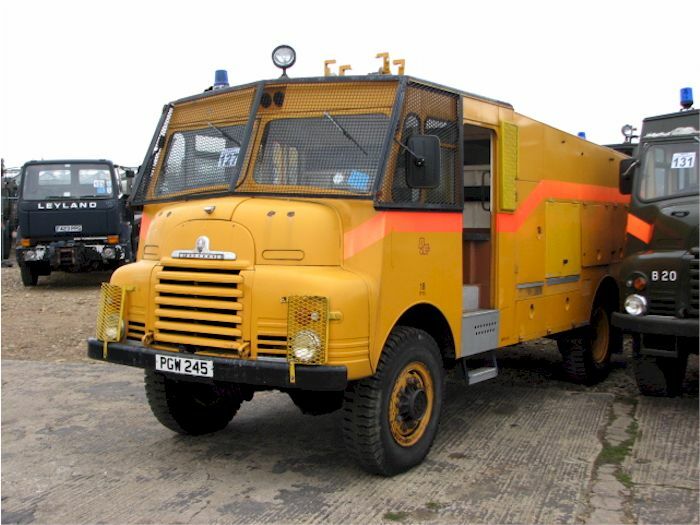 Many presume that AFS stands for "Army Fire Service" - it doesn't - it is the "Auxiliary Fire Service" and all AFS Goddesses were, like all other Home Office vehicles, painted green (BS381c - Deep Bronze Green - Tint 224). Except however, some Home Office "Auxiliary Fire Service" Goddesses were painted yellow (BS381c - Golden Yellow - Tint 356 or Bold Yellow - Tint 363) specifically to be used in Northern Ireland; a ruse to stop the locals at the time believing they were army vehicles and hopefully preventing anger being vented upon them by those opposed to the military presence. These vehicles also displayed a sign stating "Department of the Environment (NI), Roads Service, Belfast Division, Hydebank, 4 Hospital Road, Belfast, BT8 8JL" to assure everyone of their peacekeeping nature. However the military did purchase approximately 130 fire engines based on the Green Goddess design to be used as every-day operational fire engines. These comprised the "Army Fire Service". The first 80 were on the early Bedford RL chassis with the old style grill, fitted with twin amber blinkers that, at the time, were the standard visual warning device on UK fire appliances. The majority of these were delivered in the same livery as the AFS Goddesses (gloss Deep Bronze Green) for use in the UK and Europe, with the remainder delivered in a stone colour (BS381c - Light Stone - Tint 361) for service in the Middle and Far East theatres. The following 50 vehicles were built using a later chassis (post 1957) and had a chrome grille but no amber blinkers above the cab. They were delivered in red (BS381c - Signal Red) though all "Army Fire Service" Goddesses were, subsequently, repainted red. Patrick Luck kindly sent in this image to prove the existence of the non-green Goddesses. Taken in 1966, this may be at either 17 RVD Germany or CVD Marchington; but you can clearly see red Bedford RLs in the background. Military Goddesses had an extra locker down at the back, no amber blinkers and the late 1957 radiator grille design change. Three of these are known to have had bodies by Plaxton. This N.I. Goddess had radial tyres, riot screens over the windscreens, the locker handles removed and, although you cannot see it, a lockable panel at the back guarding the pump controls. N.I. Goddesses pictured at Witham's. Here you can clearly see the two different shades of yellow used for the N.I. Goddesses. Pictured by Ted Angus, to whom, along with Brian Burgess, I am grateful for the information on this page (Ed. ).